One afternoon last week, I noticed a box of flowers on the front porch. It was the standard box used by a well-known flower company. I wasn't sure how long it had been there (unfortunately the delivery drivers in this neighborhood have a habit of dumping packages on the porch without ringing the bell), but it was probably no more than a couple of hours. My first thought was that my husband had sent me flowers for some occasion I wasn't aware of, or perhaps just as an extravagant surprise. When I opened the box, the first thing I saw was the note. It was identical to the note that had been included with the flowers Hubby had sent me on Valentine's Day. Now I had two thoughts. One was that the flower company had somehow duplicated his Valentine's order. The other was that he had sent me a new order of flowers, but the company accidentally included the old note. At the same time, I felt uneasy, because the situation just seemed strange. 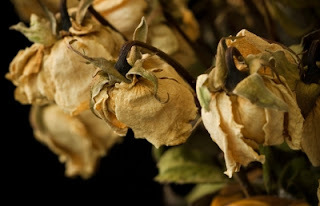 Then I noticed that the roses, peeking out of their wrapper, were withered and dead. Worse yet, when I took a closer look, I realized that they were moldy. My uneasy feeling intensified. This was creepy, and I just couldn't think of a reasonable explanation. I knew my husband would never send me dead flowers. So where did these come from? "Did you send me some flowers today?" I asked, cautiously. "I didn't. Should I have?" he asked, cautiously. I told him about the flowers. He was horrified. We were able to figure out what happened, at least in part. He had ordered flowers to be delivered to me on February 12. That day, the company notified him that there was a problem and that the flowers couldn't be delivered. Would the 13th be okay? He said yes, and on the 13th I received a fresh bouquet of roses. In the meantime, it seems that the undelivered bouquet was not discarded, but languished somewhere, possibly in a warehouse or the back of a truck. And then, for some reason, it emerged from obscurity, to be delivered three weeks late. Yuck! "I hope you know I would never send you dead flowers," Hubby said. I assured him that I know that. 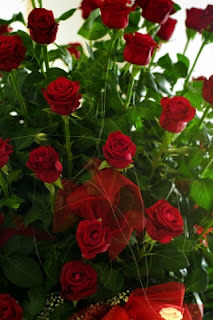 Just to be sure, he came home that night with a huge bouquet of beautiful red roses. Dead bouquet image courtesy of PANPOTE at freedigitalphotos.net. I'm glad this had a happy ending. Dead flowers, thats like something out of a horror movie. Lucky it was just a mistake.